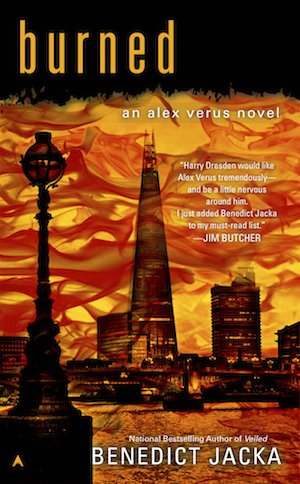 Here’s the US cover for the seventh Alex Verus novel, Burned! Up until now, the US covers have followed a colours-of-the-rainbow theme, with orange for Fated, blue for Cursed, purple for Taken, yellow for Chosen, red for Hidden, and green for Veiled. I can’t help thinking that the reason they finally decided to break from the rainbow theme was that the only colour left would have been pink, so now we’re doing dual-colours instead. The colour change is appropriate in a way – Burned will mark a turning point in the series. Some major things change in this book, and from this point on, the Alex Verus books will be a lot less episodic and a lot more centred around the primary plotline. We’re still a ways off from the endgame, but we’re moving towards it. I echo Richard here that’s stunning. Very Nice. US publication date is when? The Spring? Very cool. I can’t wait to get my hands on this book. Fantastic cover! To see it and the description ahve made me excited beyond words.